Motorola released Droid Raztr, upgraded version of Droid , like iPhone 4S is upgraded version of iPhone 4 :)).With many great fetures are announced like its ultra thin just 7.1 mm built of scratch resistance Corning Gorilla Glass with water repellant nano coating . It will be powered by 1.2 Ghz processor with 4.3 inch super Amoled HD display. 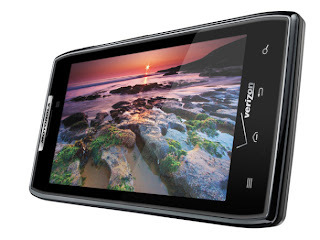 It ships with Android 2.3.5 Gingerbread along with support for Verizon Wireless 4G LTE. , 1GB of RAM, an 8-megapixel rear camera with 1080p HD video capture and image stabilization, a front-facing HD camera for video chat. It has 32GB of memory--16GB on board and a preinstalled 16GB microSD card. Other features include Quickoffice for documents, Motocast for streaming or downloading media from the PC to the phone. The Motorola Droid Razr will be available for $299.99 in early November after a new two-year service agreement with Verizon Wireless. Pre order starts from October 27. Personally, i don't think it will beat iPhone 4S because iPhone is a legend , it just not because of its polished UI but the availability of apps, loyal Apple fans which makes Apple ,the leader of mobile industry.